Eventide Fenway uses Toast Go™ handheld devices and Toast Kitchen Display System (KDS) to seamlessly connect the front- and back-of-house directly with their guests. John Myers is the General Manager at Eventide Fenway, a modern fast casual concept bringing the best of New England cuisine to the booming Boston neighborhood. Aided by best-in-class technology, Eventide delivers a high touch guest experience in an efficient fast casual model. Eventide uses Toast Go™ handheld ordering technology and digital kitchen display screens to seamlessly connect the front- and back-of-house directly with guests. "When guests walk into Eventide Fenway," John explains, "they approach the counter and someone with a Toast Go™ is ready to greet them. When they place their order, we ask for their phone number. This unique interaction allows us to notify them when their food is ready." Orders from Toast Go™ are immediately fired to the kitchen, where line cooks and expeditors work from a digital kitchen display system. "The order is immediately fired to the kitchen display screen for the expeditor and the hot line," John says. "With the KDS, the people working the line know exactly how many burger patties and fish filets they need to be prepping at any moment. The expeditor sees that too. It adds a new level of non-verbal communication." "As each order is completed," John adds, "the expeditor taps a button on the KDS and the guest is notified via text message." "When guests walk into Eventide Fenway, they approach the counter and someone with a Toast Go™ is ready to greet them. When they place their order, we ask for their phone number. This unique interaction allows us to notify them when their food is ready." Eventide Fenway developed a continued service model which builds in more face time and upsell opportunities with guests. "Toast helps us bring the continued service model to life with handhelds," John says. "Once they pick up their order at the counter, we didn't want the guest's interaction with the restaurant to be finished. So we have servers that roam through the dining room with Toast Go™ handhelds. It allows us to have another interaction with the guest and to sell a few more food items before they head out the door." Toast Go™ handhelds have the full functionality of a stationary terminal, empowering servers to care for the guest without leaving the table. "With handhelds, servers take the order tableside, process the credit card transaction right there, and the guest can sign right on the screen and can get a receipt emailed or texted," John says. "It's an exciting way to do things. It's been fun and interesting for our guests." With a built-in credit card reader, hand strap, and pocket-size dimensions, John and his team have found Toast Go™ to be better equipped for the restaurant environment than consumer-grade tablets. "It's clear that Toast Go™ was designed to be used in a restaurant," John says. "With our previous iPad system, we had issues with cracked screens and broken charger ports. Toast Go is a more rugged and durable solution for the long term." 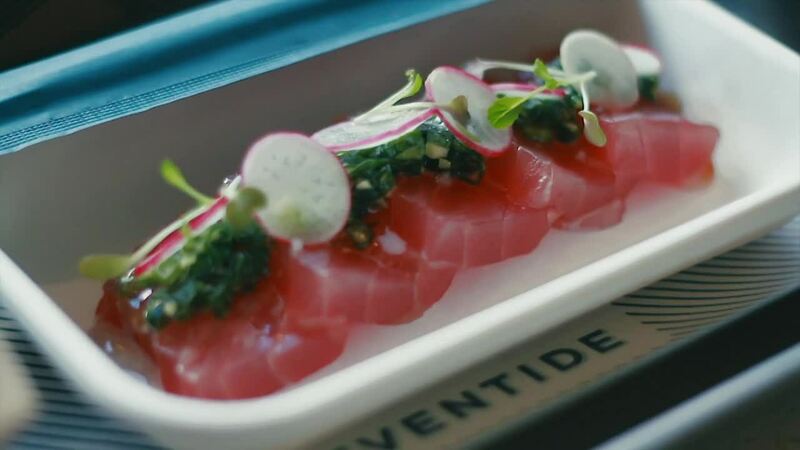 Eventide Fenway marries technology, award-winning food, and personal service to create a delightful guest experience every time. "Toast makes me feel confident that I can do my job and not worry about the underlying technology behind it," John says. "I'm excited that Toast is there to make our restaurant more efficient, more exciting, and that they are there to help us take things to the next level."